Coconut Water: A Health Tonic or Just another Fad? You are here: Home / Blog / Coconut Water: A Health Tonic or Just Another Fad? You’ve heard of coconut water I assume? It seems like every celebrity on the planet has been promoting this miracle drink on social media. Okay, that’s an exaggeration – but there really has been a lot of coconut water drinking recently. All of the interest has grown the industry substantially, and coconut water now earns $40 to $60 million each year (1). But, just how magical is this drink really and are there any real benefits of coconut water? Certainly, claims about coconut water are all over the place and it’s hard to work out what is real and what isn’t. Some people view it as this fantastic, nutrition packed drink and that there are significant coconut water benefits for your health. Others say that it is no better than simply drinking water. So, how do these myths compare to reality? Well, that’s what we’re about to find out. But, before we do that, let’s start with a little background. The term coconut refers to the species Cocos nucifera, which is a member of the palm family. Technically, the word coconut can be used to refer to the tree itself, as well as the fruit. However, most of the time, coconut refers to the fruit. As you may have seen, the coconut tree grows large and can be close to 100 feet high (2), although there is considerable variation. Botanically, the fruit of the coconut tree is considered to be a drupe, which is a specific type of fruit (a nectarine is another example). When fully ripe, a coconut has a brown husk and a thick layer of white flesh (sometimes called coconut meat). Additionally, there is liquid within the middle of the coconut. This liquid is most significant when the coconut is in its earlier stages of development. As the coconut matures, nutrients are pulled from this liquid into the flesh of the coconut. There’s actually a few different products that come from coconut, and this can get a bit confusing. Coconut Water: The liquid from inside the coconut. Like water itself, this liquid is clear. Coconut Milk: This liquid comes from the grated meat/flesh of brown coconuts. It is milky and tends to have a rich taste along with high oil content. Coconut Oil: This is an edible oil extracted from coconut kernels or the flesh of the coconut. Because of the way that nutrients are pulled from the liquid in coconuts as they mature, the most nutrient-rich coconut water comes from green coconuts (i.e. coconuts that are not fully mature). This is the time where coconuts consist mostly of water and have very little flesh. This is also when coconut water has the best taste and is enjoyable straight from the coconut without the need for any added flavorings. In contrast, as the coconut ages, the water tends to become acidic and isn’t so palatable, while the amount of flesh in the coconut also significantly increase. Despite this, some companies that produce coconut water use water from mature coconuts, as a way to save money. They will often add in flavorings and sweetener to try and mask the acidic taste of the mature coconut. Regardless of whether you want to get the benefits of coconut water or just want a nice tasting drink, coconut water from green coconuts is the best way to go. Technically speaking coconut water is a form of fruit juice, even though it is rarely called that. However, there are also some pretty major differences between coconut water and most other juices, especially as coconut water is not as high in sugar or as sweet. This makes it more viable to drink frequently than most other types of fruit juice. Coconut water also has a history as a medicine. For example, within Sri Lanka, coconut tends to be consumed daily and there are many references to medicinal uses of coconut water (3). In modern times, the popularity of coconut products, including coconut water, coconut milk and coconut oil have made coconuts a popular resource and they are produced in more than 90 countries. Coconut palms grow best in moist climates and when produced in dry climates they need substantial amounts of irrigation. The image below shows the top ten countries producing coconuts in 2013. Data for the image comes from FAOSTAT. Because of this, many companies producing coconut water in the United States rely on coconuts from the Philippines or from Indonesia. The hype about coconut water frequently focuses on the idea that it is a natural sports water. This is thought to be one of the key benefits of coconut water and the idea has a lot of support. Part of the concept is that coconut water has many more nutrients than water itself while also being low in calories and free from cholesterol. Coconut water also tends to be sweet and nutty, making it a good option for people who like the taste. While coconut water does have sugars and calories, it contains much fewer calories than most sports drinks. This can make it very appealing for people looking to lose weight. In some ways, coconut water is superior to sports drinks, but it is also a very different product with its own strengths and weaknesses. One of coconut water’s claims to fame is being low in sodium compared to most sports drinks. This is largely true, although it is very brand specific. For example, the image below compares four brands of coconut water and two sports drinks in terms of the amount of sodium per 100ml (Data from 4,5,6,7,8,9). As you can see, for most brands, coconut water is lower in sodium. It’s a strange claim though. Yes, sports drinks are high in sodium. That is actually the point. People drink sports drinks for all sorts of reasons and they can be really unhealthy if you do that. The drinks are specifically designed to help people stay hydrated during and after exercise. The salt is important for this role, because as people exercise they lose salt through sweat. Additionally, the salt plays a role in water retention. Additionally, the sodium in coconut water is still concerning. If you are drinking it as a sports drink after exercise, then yes, sodium is important. However, if you are having it as a casual drink, sodium is much less desirable. The current guideline for sodium intake is 2,300mg per day for adults, although some groups should be consuming even less sodium. Yet, on average, Americans consume around 3,400mg of sodium per day (10). Too much sodium in the diet can increase blood pressure, which is a risk factor for a number of other diseases (11). Now, if you are healthy and eat well, too much sodium probably isn’t something to worry about. But, for much of the population, excess sodium is a cause for concern. In fact, many people are already supposed to be on sodium restricted diets (12). What the sodium in coconut water means to you will depend on your own needs and whether sodium intake is something you need to moderate. Regardless, it is something that you should be aware of. Is Coconut Water Better Than Sports Drinks? There is certainly a lot of hype around the idea of coconut water as a sports drink. Sports drinks play a few different roles. They offer a quick source of energy during and after exercise, and they also offer a way to rehydrate following exercise. Intensive exercise can also be challenging for the body, and sports drinks play a role in helping the body to repair. The sodium and electrolytes present in sports water play a key role in helping it to achieve this goal. Research indicates that coconut water can hydrate people effectively after exercise, but the study noted little difference between the four liquids that were provided. The image below shows the outcomes of the study for plasma osmolality after exercise (which offers an indication of rehydration). The overall outcome of the study was that for most measures there were no significant differences between the four different liquids. However, the study did note that coconut water was more likely to cause stomach upset than the bottled water or sports drink (13). This may have occurred because of the coconut water or simply because participants would have been more familiar with water and sports drinks. A second study found similar outcomes in a group of eight participants (14). The outcomes of the studies do suggest that it can play an effective hydration role, but it is no better than other options. However, the low calories in the beverage are counterproductive when it comes to exercise. The higher calories of sports drink help to provide athletes with energy, which is important during exercise. As such, coconut water is effective at hydration, but not at any other roles that sports drinks play. In fact, coconut water companies have been forced to stop claiming that they are better than sports drinks (15). It also isn’t any better for hydrating than water or sports drinks are. Honestly, I think the comparison between sports drinks and coconut water is a little weird. Most athletes wouldn’t seriously use coconut water because of its lower sodium content, and the lower calorie content also doesn’t help. Yet, there are so many people who say that coconut water is so much better. In fact, I’ve even come across sites that emphasize how much more potassium coconut water has compared to sports drinks. Sports drinks don’t have much potassium because potassium doesn’t have that much to do with rehydrating. Sure, potassium is an important nutrient, but that really isn’t relevant to the comparison. Coconut water may still be valuable as a casual drink because it is less sweet that other fruit juices and contains significantly fewer calories. Indeed, the 100ml serving that I mentioned earlier has just 19 calories. Of course, plain water is a healthier option in terms of calories, but then, it always is, isn’t it? Coconut water does offer a nice alternative if you want something different than plain water, as long as you keep an eye on your sodium intake. Likewise, it can offer a good way to get hydrated, especially as the sodium can play a role in helping you to retain water. So, what can coconut water do for health and what can’t it do? Certainly, the hype behind coconut water is too good to be true, but does that mean that coconut water is entirely useless? There are some claims that coconut water can help to decrease blood pressure and help to reduce the risk of heart disease. Research has also supported this perspective. For example, one experimental study placed 28 participants with hypertension into four groups, each of which received a different treatment. The study showed that the group receiving coconut water experienced a significant decrease in blood pressure compared to the control. However, an even larger decrease was observed in the group that was given mauby and the coconut water (16). An animal study also considered the impacts of coconut water on hypertension (high blood pressure). In this study, the authors used a fructose diet to instigate hypertension in the rats and tested the impacts of treatment with coconut water. The authors found that treating with coconut water did successfully reverse high blood pressure in the animals (17). Another study looked at the role of coconut water in protecting the heart specifically. This study used animal models and considered whether coconut water could protect against a heart attack. The author found that coconut water did affect a number of risk factors for cardiovascular issues. Additionally, the rats fed coconut water showed improved recovery (18). The authors argued that the observed outcomes were the result of a range of factors in the coconut water, including magnesium, calcium, potassium and L-arginine. Overall, the evidence for coconut water decreasing blood pressure and improving cardiovascular health overall are limited. The studies on the topic are relatively few, and many of these have used small sample sizes, which limits their ability to detect effects. This means that coconut water may decrease blood pressure in some populations, but this effect will not necessarily be the same for all people. Additionally, a number of the studies have used animal models. While animal models can offer valuable information about the potential health impacts of a given compound, animal models are also limited. Specifically, the differences between animals and people mean that many of the observed effects may not hold true for humans. The idea that coconut water may decrease blood pressure is strongly related to the potassium present. Now, coconut water does have a relatively high level of potassium and many people don’t get enough potassium in their diet (19,20). Likewise, potassium does play a role in reducing the risk of heart disease and blood pressure. This role is well-known, and it’s one of the reason that potassium is such an important nutrient (21). So, if you are deficient in potassium, coconut water might be useful. However, the sodium in coconut water has the opposite impact. For people who already get too much sodium, this means that coconut water probably won’t be beneficial. In the four brands I looked at, the potassium content averaged somewhere between 15% and 20% of the recommended intake of potassium per day for a serving size. The nutrition labels use 3,500mg as the value for daily potassium intake, so 20% of this is somewhere around 700mg of potassium per serving. This does make coconut water a relatively decent source of potassium, but there are other good sources too (22). Modern interest in antioxidants has been strong. Antioxidants are promoted as having a number of positive health impacts, including protecting the body from disease development and improving overall health (23). This occurs because antioxidants are able to protect against oxidation within cells. Fruits and vegetables have been found to be particularly strong sources of antioxidants and suggested as important ways of promoting health (24). There is considerable variation in the antioxidant activities of different fruits and vegetables, but antioxidant activities may be one reason for the observed benefits of coconut water (25). Indeed, coconut water does have significant antioxidant properties (26). This antioxidant function is present across multiple different varieties of coconut (27). For example, one study argued that the protective role that coconut water exhibits in regards to heart attacks is the result of its role as an antioxidant (28). Another similar study showed antioxidant effects of coconut water in rats with induced liver damage (29). These outcomes illustrate that coconut water may potentially decrease oxidative stress in rats. Research also suggests that more than one component of coconut water may be responsible for the observed antioxidant impacts (30). The antioxidant properties of coconut water may lead to positive health impacts, including anti-aging impacts (in accordance with the free radical theory of aging). Despite this, very little research has been done on the antioxidant outcomes of coconut water and most studies have been conducted in animals. It is also important to note that while coconut water does have antioxidant activity, it is relatively low compared to a large range of other fruits, such as strawberries, plums, lemons and bananas (31). These factors suggest that coconut water is an antioxidant, and may help health. However, the benefits from coconut water antioxidants are probably not as strong as advocates claim. Coconut water has been suggested as a treatment for children with dehydration from diarrhea – however, the evidence for this use has been limited. 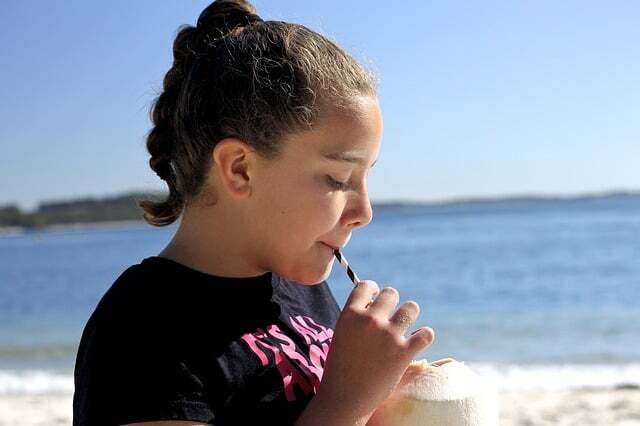 One study suggested that it might form a valuable role for children who are well-nourished and are not dehydrated (suggesting that coconut water might prevent dehydration, but not help children recover from it) (32). Yet, another study indicated that coconut water did not have the necessary chemical composition to act as a rehydration solution (33). Even if coconut water did work for this role, there are multiple other liquids that are more effective and more commonly used as a rehydration agent. When people talk about the benefits of coconut water, the potential for coconut water to influence cholesterol is often overlooked. Yet, research has suggested that coconut water might be able to improve cholesterol ratios in the blood. One animal study exampled this topic looking at rats on a high-cholesterol diet. The cholesterol-based diet increased the overall cholesterol as well as levels of LDL and VLDL cholesterol (low-density lipoprotein and very low-density lipoprotein, respectively). However, the coconut water was able to improve the outcomes from the high cholesterol diet (34). An extension of that research indicated that the cholesterol-lowering properties of the coconut was were similar to the drug lovastatin (a statin), which is used for a similar purpose (35). While this outcome is promising, it is still preliminary and much more research is needed. But, the need to lower cholesterol is actually a highly divisive topic, and as I show in my post on the cholesterol controversy, there really isn’t that much evidence that lowering cholesterol is beneficial. The most limiting aspect of this research is that it uses animal models exclusively. This offers little indication of whether similar cholesterol lowering impacts would be seen in humans. While effects observed in animals do often apply to humans, this is not always the case. An animal study also indicated that coconut water may play a role in countering high levels of blood glucose, suggesting a relevance for people with diabetes. The study found that providing rats with coconut water orally for a period of 45 days was able to significantly reduce blood sugar (36). Once again, more research is needed to determine just how accurate and relevant this outcome is. Interestingly, that particular study focused on the potential benefits of coconut water from mature coconuts, rather than green (or tender) coconuts. Coconut water does have a significant number of vitamins and minerals, but the claims are still a bit misleading. For example, below is a breakdown for some of the key nutrients for a serving size of four brands of coconut water (the serving size for ZICO was 11.2 fl oz and around 8 fl oz for the other brands). In fact, the only compound other than those four present in a decent proportion was sodium, and we talked about that one earlier. Of these four compounds, the only really high number is vitamin C for ZICO Natural. That number isn’t even accurate because the vitamin C is an added ingredient for that brand. Out of the rest of the nutrients, the only one that really stands out is potassium. Most of us don’t get enough potassium, so yes, this is certainly a good thing. However, I personally wouldn’t say coconut water has a high amount of potassium when it’s less than 20% of the daily intake. The other numbers are even lower. On average, coconut water has less than 5% of the recommended intake of calcium and magnesium. That isn’t a rich nutritional profile at all. You would have to be taking a lot of coconut water to get anywhere near the recommended daily levels. If you did that, you would also be getting pretty close to the daily intake of sodium (which isn’t ideal). There are also small amounts of other amino acids, minerals and vitamins in coconut water, but again, they aren’t spectacular (37). In reality, aside from potassium, the vitamin and mineral profile of coconut water is pretty limited. Is Coconut Water Worth It? Coconut water is a big craze, but it isn’t really as wonderful as the marketing suggests. Research does suggest that there may be some health benefits, and the water does have some nutrients, even if the levels are nowhere near the hype. Likewise, coconut water may help to improve cardiovascular health and help to lower blood pressure. Like any food or drink, you should have coconut water in moderation. Despite its low-calorie count, coconut water is still relatively high in sugars. The calories can also add up if you are drinking multiple servings of coconut water in a day, which many people do. Additionally, the sodium in coconut water really is significant. This might not be an issue for one or two servings, but again, if you are having coconut water frequently, the sodium is something you have to be aware of. The most obvious choice with coconut water is drinking it as a beverage, either from the coconut itself or from a glass. But, that isn’t appealing to everyone. In fact, despite the apparent popularity of coconut water, there is also a lot of debate about its taste. Many people aren’t particularly keen on the taste of coconut water, especially the kind that comes in packets (versus actual coconut). There is no single best way to use coconut water. So, if you don’t like the taste of coconut water itself, have a look at some alternative ways of getting the benefits of coconut water. They are a great way of getting healthy nutrients into your diet and there is so much flexibility in the recipes that you use. 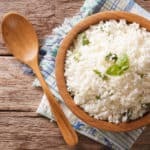 Some recipes will highlight the taste of certain ingredients (like coconut water) while others will bury the taste altogether (which works well if you don’t actually like the taste of coconut). One of the simplest approaches is to simply start off with a recipe that you like the sound of and tweak it over time until you get something that you find personally appealing. A great trick for making coconut water smoothies is to freeze the coconut water. This essentially gives you coconut water ice cubes, which can be used instead of normal ice cubes to give a smoothie texture. Alternatively (or additionally) you can use frozen fruit. Alternatively, you could use fresh fruit and frozen coconut water, the outcome is roughly the same. You can find another recipe at the site Around My Family Table. One alternative way of using coconut water is in coconut water kefir. Kefir itself is a fermented milk product. It is thought to be particularly good for health because of the large number of probiotics present (38). Coconut water kefir is a bit different, as it doesn’t use milk, but it is still a fermented product and can be quite a tasty one. There is a good recipe for coconut water kefir at the site Phickle and the site itself offers a strong introduction to the overall idea of fermenting. Coconut water can also be used in a number of different recipes. For example, you can use coconut water instead of normal water when making soups or when boiling rice. If you aren’t confident about trying that, you can always use half coconut water and half normal water. The site Hello Glow also offers a list of 25 coconut water recipes that you can try. In terms of health, the absolute best option for coconut water is to go completely natural. By that I mean buying fresh young coconuts and having the coconut water directly from these. You can also sometimes find these as ‘white’ coconuts. These are essentially green coconuts, but their skin has been trimmed to make them a bit lighter and smaller for shipping. A secondary advantage is that this leaves you with the coconut flesh, which you can then use as a dessert. But, if this doesn’t work for you, what are the alternatives? Certainly, some brands are better than others and have less additives or processing. The most obvious place to buy coconut water is from the grocery store, but often the brands from grocery stores aren’t all that great. Some of the more specialized grocery stores are a better choice, such as Whole Foods and Trader Joes. These often focus on healthier foods overall and foods with less additives. Health food stores or online sites are also good options for where to buy coconut water. While online sites don’t always specialize in health foods, they have a huge selection and it is much easier to compare brands that way. With any health craze, there are some manufacturers that try to make as much profit as possible and they’re often misleading in the process. Because of this, some products promoted as natural coconut water don’t even get close to their marketing. Coconuts are grown in many different parts of the world, and the source of the coconuts can affect the overall taste of the product. Some of this difference is due to the processing approaches used, but most of this difference comes from the coconuts themselves, such as the variety of coconut, the growing conditions and the soil. Much of the time, coconut water seems to be made from coconuts sourced in either Brazil or Thailand. In general, coconuts from Thailand tend to be sweeter and are grown that way. In contrast, coconuts from Thailand tend to have a stronger coconut taste. Another source is Indonesia, and these tend to have the sweetness of coconuts from Thailand. People vary in which coconut source they prefer, but if you keep an eye on where coconuts are sourced from, you can quickly get a sense of your own personal preference. Coconut water tends to come from young green coconuts – and for good reason. Using young coconuts makes the coconut water sweet, and that’s also why the water tastes so good. However, some companies try to take shortcuts by using mature coconuts. This can be much cheaper for the company, but not so good for the consumer. As coconuts age, the nutrients from the water start to go into the flesh of the coconut. This majorly changes the taste of the water, and means that it is less healthy overall. Essentially, if you were to drink the juice from a mature coconut, you would be getting a watered down version of normal coconut juice. The juice also tends to taste more acidic, which isn’t exactly appealing. This creates another major issue. When companies use mature coconuts they have to add flavors and sweeteners just to make it taste good. This tends to make the coconut water much less healthy. In general, you will find that coconut water with additives comes from mature coconuts, while coconut water without the additives is from the younger coconuts. Either way, picking coconut water without flavoring or sweeteners is certainly the way to go. As with most fruit juices, some companies make drinks that are made up of coconut water from concentrate. In many cases, the companies will also use terms like ‘100% coconut water’, ‘pure’ or ‘natural’ to describe their product. Those terms imply that the product really is just coconut water, but the phrases are actually marketing tricks – and they are largely meaningless. In the same way as other juice concentrates, coconut water concentrate is created by heating coconut water and reducing it to a syrup. This syrup is then easier and less expensive to ship, which can save the company money. Then, all they have to do is add water back to the product before they sell it. Additionally, there is also the potential for juice made from concentrate to have other additives in it, especially as the ingredients label doesn’t have to give this information. The nature of the heating means that when the concentrate is created, some of the nutrients in the coconut water can become inactive. This means that coconut water from concentrate tends to be less healthy than coconut water that hasn’t been concentrated first. Thankfully, figuring out whether coconut water is from concentrate or not is easy, as companies do have to put this information on their labels. One of the major challenges with food is the balance between longevity and health. With coconut water, as with most other food products, some companies favor one approach, while others favor a different one. For example, coconut water is perishable and should be kept cold ideally. Yet, most versions of coconut water in stores aren’t kept in cold areas. This can be done because of the pasteurization process. Pasteurization involves heating up the coconut water to kill the bacteria in it. Unfortunately, the process of heating up solids or liquids can sometimes change their chemical composition. In the case of coconut water, most of the nutrients do remain the same, but some of the volatile components do change (39). This may affect the nutrition of coconut water. Additionally, many people argue that the process of pasteurization negatively affects the flavor of coconut water. The best approach to take is to find coconut water that hasn’t been pasteurized. However, this can be difficult to do. An alternative approach is high pressure processing (HPP), which is a form of pasteurization that does not require high temperatures. This makes it possible to pasteurize the coconut milk without harming its nutrients. Of course, finding coconut water that has used HPP can be challenging. There is also an additional issue. The FDA does not actually consider HPP to be an adequate method of pasteurization on its own. Instead, companies are also required to significantly decrease the pH of their product. Doing so involves adding other ingredients, like citrus extract. At present, there are some brands that offer raw coconut water, but the FDA is cracking down on these brands, so they may not be around for that much longer (40). Coconut water is a heavily marketing product and that marketing doesn’t always stand up to reality. Nevertheless, even pasteurized coconut water offers some potential health benefits. After all, it is considerably less processed than most drinks on the market and many brands avoid added ingredients. 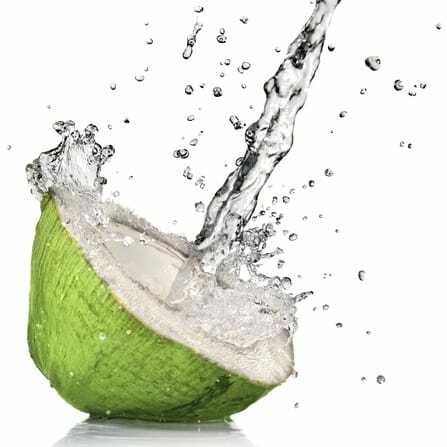 When it comes to coconut water brands, you are really looking at three things: the nutrition, the price and the taste. Finding a good balance can be tricky, but some brands are certainly better than others. One thing to be aware of is that brands tend to change their ingredients and techniques over time. For example, a brand might change to using coconut water concentrate, or they might change where their coconuts are sourced from. This means that a brand might taste good for a while and then the taste changes significantly. Most of the time, the package labelling won’t change, so you might get a sudden surprise when you try a brand. This also means being careful when reading reviews of a product’s taste. Positive reviews from 2011, for example, don’t necessarily mean that the product tastes good now. As is always the case, people vary considerably in their opinions about taste. So, some people may love a specific brand, while others find it difficult to stomach. Ultimately, the best indication of whether you will like the taste of a particular product is taking the time to try it out yourself. The best brands are the ones that offer raw coconut water that isn’t from concentrate. I am highlighting a few common ones in this post, but there are also others, including some that are only available locally. These brands do offer the best benefits of coconut water, but be warned, they often have a hefty price tag. This brand is certified organic and offers raw coconut water. The coconut water has never been heated, although (unusually) it is sold frozen. This brand offers raw organic coconut water, so it’s as close to the real thing as you are going to get. The taste also seems to be popular, with most reviewers loving it. In fact, the main negative Amazon reviews were from people complaining about the price, not the product (as it is cheaper at stores like Trader Joes and Whole Foods). The taste combined with the nutrition of this brand makes it a very good choice. However, the price does make this a challenging choice. In stores, the brand ranges from $3 to $5 for a 16oz bottle and the bottles are even more expensive online. This is another brand that uses natural coconut water with nothing added and no heat pasterization. It is also doesn’t use any GMOs and the brand is organic. There are some coconut water brands whose only crime is high heat pasteurization. Pasteurization is a major issue if you are wanting to get the most out of your coconut water. However, if you are just wanting coconut water for rehydration or as a casual drink, heat pasteurization doesn’t matter all that much. The most relevant compounds for hydration are the potassium and sodium, and these compounds survive the pasteurization process unharmed. With that in mind, here are a few brands that seem decent even though they use pasteurization. They offer good alternatives for people who are mostly interested in hydration or for people on a tighter budget. This brand packages its coconut water in steel and aluminum cans, rather than tetra packs. Although these might be less appealing to some, they are fully recyclable and have a long shelf life. This brand does heat pasteurize, but taste-wise it is one of the most popular. While the brand does not have organic certification, the company does claim that chemicals are not used in any part of the growth or processing of their coconuts. The company also offers versions of coconut water with and without pulp, giving people the option to pick what they prefer. One of the more common brands out there is Zico Coconut Water. With this brand, there are two different options. You can get the coconut water in plastic bottles or in tetra-packs (cardboard cartons). The plastic bottle version of the coconut water is made from concentrate, which is definitely something to avoid. The tetra-pack version is a bit better, especially as they don’t have any additives either. However, both versions of the coconut water are pasteurized in high heat. Zico is an example of a brand that has changed significantly over time. Many people used to swear by the brand in terms of taste, especially as it is relatively low in price. However, recent changes in formula means that the taste has changed dramatically. Many people say that it tastes horrible, especially for the bottled version. While the bottled version of Zico isn’t a good choice for coconut water (as it’s from concentrate), the tetra-pack version appears to be much worth considering. It might be organic, but this brand uses coconut water from concentrate and also adds in flavoring. The brand does have a Coco libre protein range, which is a bit unique. 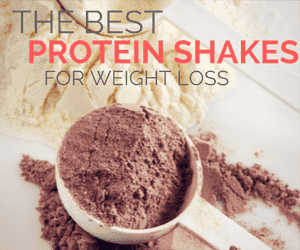 It offers a combination of a protein shake and coconut water. I’m not sure whether it tastes any good, but it is an interesting approach and might be relevant to people who enjoy protein shakes. I’ve put this as a brand to avoid, but some people might feel that the protein range has benefits that outweigh the negatives. 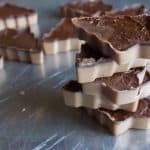 However, you can always make your own version using coconut water and whey protein and get all the benefits of coconut water instead of only some of them. While Vita Coco’s coconut water isn’t from concentrate, it does have added ingredients. Even the non-flavored version of the drink has added sugar and added vitamin C.
So, it isn’t nearly as natural as the label claims. In fact, some reviews on the taste of the coconut water even commented that it tastes too sweet (e.g. 41), although others felt that the sweetness was about right (e.g. 42). The brand is, of course, pasteurized with high heat, as all the major brands seem to be. This brand also has a range of different coconut waters targeted at children. These are only 50% coconut water, have added sugar and a range of ‘natural’ flavors. Not a healthy choice at all. Coconut water from the Naked brand is one that I’m not too sure about. The coconut water looks good at face value, but that’s about it. The ingredients list for the plain version of the product just says coconut water, and the product isn’t from concentrate. The flavored versions of the coconut water (including lychee, peach mango and pineapple) do have more ingredients, but that is to be expected. In the past, the company has noted that it uses heat-based pasteurization and that they use mature coconuts instead of young ones. Plus, Naked is a PepsiCo brand. Personally, I don’t like the idea of buying any health product from a company that specializes in very unhealthy products. The company has also gotten in trouble over the Naked brand before, specifically for the use of the phrasing ‘all natural’ on their products (43). Many of Naked’s smoothies contain a substantial amount of additives and in many cases they contain as much sugar as Pepsi. Their labelling tricks people into buying them thinking that they are consuming something healthy. In fact, in 2013, PepsiCo settled a lawsuit that took issue with a number of the phrases used in the products and the labeling has been taken off Naked products (44). While Naked’s coconut water doesn’t appear to have additives, I wouldn’t trust a company and a brand that has been so misleading in the past. This brand of coconut water used to be relatively decent, despite having high heat pasteurization. However, the brand has changed its formula recently to include ‘natural flavors’. This is always a concerning ingredient to include on any product. The implication is that natural flavors are better (and less processed) than their artificial counterparts. While natural flavors might be sourced from nature originally, they go through substantial modifications and don’t end up resembling anything natural at all (45). Personally, I don’t want anything like that in my coconut water. If the water was from young coconuts to start off with then those added flavorings wouldn’t even be needed, which is another strike against the brand. Even though it’s organic, this company uses coconut water from concentrate as well as high heat pasteurization. Storage of coconut water varies considerably depending on the manufacturer, the packaging they use and how the product is pasteurized. Any coconut water you buy should have a best by date, which will give you an indication of how long that product will last for. Some companies also give an indication of the shelf life of their product on their site. For example Amy and Brian’s Coconut Juice notes that the product shelf life is two years, while the shelf life of Vita Coco Coconut Water is 12 months. If the product is pasteurized with HPP methods, its shelf life will be shorter. Likewise, the shelf life of raw coconut water (like Harmless Harvest) is around 60 days. Once the coconut water has been opened, it should be stored in the refrigerator and consumed within a couple of days. For a fresh coconut, the shelf life is around a week or two weeks in the refrigerator (46). Coconut water is also sometimes used in curry recipes (like Thai Curry), but other recipes use coconut milk. Does Coconut Water Have A Medical Role? One exaggeration concerning coconut water is the idea that it is used medically to treat dehydration, particularly through an IV. There have been cases in history where coconut water has been used in this way, specifically in cases where normal saline solution was not available (47,48,49). There is some merit to this perspective because if the coconut is not damaged then the water inside it should theoretically be sterile. Coconut water is far from ideal in this role, because its sodium level is too low to ensure it stays in the bloodstream. Additionally, the presence of other vitamins and minerals could have unexpected negative impacts on health. While it may have been used as an emergency measure in some very specialized situations, coconut water certainly isn’t suitable for injecting in the bloodstream and there are many better alternatives. Nevertheless, some physicians do suggest coconut water as an oral approach to treating dehydration. Certainly, the fact that coconut water has a taste means that people will tend to drink more of it than they will plain water – provided they actually like the taste. Additionally, it tends to be more diluted than sports drinks, potentially making it a better choice. Can Coconut Water Help Me Lose Weight? There isn’t anything special about coconut water that promotes weight loss. However, if drinking coconut water helps you to stay hydrated more often, you might lose some weight that way. Additionally, if you replace high calorie drinks (like soda or fruit juice) with coconut water, you may also lose weight, as you are decreasing how much energy you are taking in. In both cases though, you would lose as much weight, if not more, by using plain water instead of coconut water. How Accurate Are The Nutritional Labels? Nutritional labels are the only way we can really know what’s in the products we eat and drink, including their calories and levels of nutrients. However, there is never any guarantee that these labels are accurate. Often there will be slight variations in the information listed compared to the actual product. In some cases, this variation will be substantial. Independent testing for some of the coconut water brands has shown that the labels on coconut water are not always accurate (50,51). In this particular case, the research showed that in two out of the three brands tested, levels of sodium were significantly less than the nutritional label suggested. The magnesium levels also tended to be lower than claimed. These differences are very significant, because both of these compounds are linked to the rehydrating potential of coconut water, as they are both electrolytes (52). In turn, the ability of coconut water to rehydrate is still one of the key reasons that people drink it. Yes, coconut water is considered Paleo by most people. One argument for this is that some cavemen did have access to coconuts, even though most did not. You do still need to be careful of the sugar content as it is relatively high for a Paleo food. When consumed as a drink, there has been no evidence of significant side effects from coconut water (53). Because coconut water is sometimes touted as a way to reduce blood pressure, anyone on blood pressure medication should consult their healthcare provider before starting with coconut water. Is It Expensive to Buy Coconut Water? The cost of coconut water does depend a bit on the brand you buy and how specific you are about processing and whether it is organic. Some brands of coconut water are relatively inexpensive, but the ones that don’t use high heat pasteurization are often considerably more expensive. What’s the Difference between Coconut Juice and Coconut Water? The two terms mean exactly the same thing and they both refer to the liquid within coconuts. Coconut water tends to be used most of the time, probably because the liquid does look like water. However, coconut juice is probably more technically correct. After all, we use the term juice for the liquid from any other fruit or vegetable. Why Is Coconut Water So Popular? The huge following behind coconut water is kind of surprising. Coconut water has been majorly popular among celebrities and many of them have been photographed with the drink. Yet, in many ways the liquid is very simple. 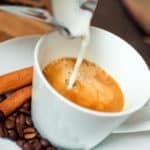 While it may well offer some health benefits, it certainly isn’t the miracle drink that so many people claim. This begs the question, why is the drink so popular then? Part of the story is probably the low calorie nature of the drink. That makes it appealing for any celebrity watching their figure (which is most of them it seems). The other part of the story is the way that celebrities tend to create and maintain popularity trends. For example, Madonna is an investor in Vita Coco, as are a few other key celebrities. This makes them more likely to promote the drink among other celebrities, and Madonna alone is still a pretty major influence on behavior (54). The rest of the population tends to follow in the footsteps of celebrities pretty readily. A lot of us seem to feel that if celebrities approve of something, then it must be a good idea – although this really isn’t true. At the same time, many bloggers and websites are quick to praise coconut water. These posts often involve hyped up claims without evidence supporting them. Many people end up buying into this hype and promoting coconut water among friends and family, which makes coconut water even more popular. There is one more reason too. Coconut water naturally appeals to consumer because it is viewed (and promoted) as a natural product. Aside from water itself, there are relatively few natural beverages that people can enjoy straight from the bottle. Coconut water fills this desire nicely, and for many people this is much more appealing than any of the potential benefits of coconut water. Why Is My Coconut Water Pink? Raw coconut water will sometimes be pink, which can be surprising. This happens because of the natural antioxidant and phenolic compounds in the liquid. It is a completely natural reaction and doesn’t mean that there is anything wrong with the coconut water. In fact, plain coconut water turning pink can be an indication that you actually have raw coconut on your hands. Coconut water is an interesting topic because there is so much hype and passion surrounding the drink. Yet, in reality, coconut water does fall short of most of its claims. Yes, there are some potential coconut benefits, including decreasing blood pressure, acting as an antioxidant and providing a good source of potassium. Even in those areas, research is still in its very early stages. In other areas, the claims of coconut water barely even make sense. It certainly isn’t a natural alternative to sports water – unless you are drinking sports water when you shouldn’t be (i.e. casually) and it doesn’t hydrate any better than water or sports drinks. At its heart, coconut water is a low calorie, sweet drink with little processing and no artificial ingredients (depending on the brand you choose, of course). This makes it a good casual drink and the compounds within it may just help your health. However, coconut water isn’t water and you do still need to be aware of how much you are drinking. Both the sodium content and the calories in coconut water can add up over time, and this is very easy to overlook. So, enjoy coconut water by all means (I know I do). Just remember, it isn’t a miracle elixir, despite all the hype that surrounds it.